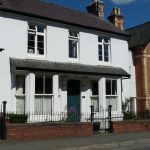 Beech Villa is a lovely town house situated just a short distance from Knighton’s town centre and railway station. We offer bright, comfortable bedrooms, a guest lounge with television, WiFi and a garden to unwind in. Secure and covered space available for bicycles. Vegetarian and free-range cooked breakfast.